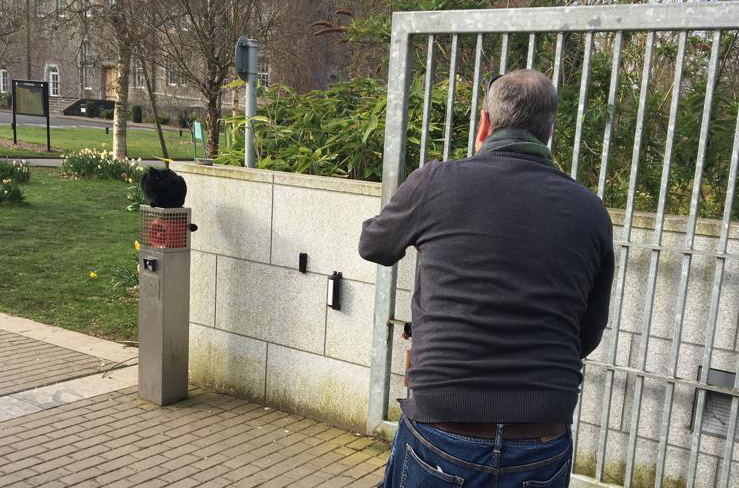 As I was walking into work this morning I noticed that the local celebrity cat was preparing for a location shoot for a film he’s going to be starring in. I’m not at liberty to give any more details about the film, but I’m not surprised he’s been offered a central part as he is a natural in front of the camera. In my experience cats are generally difficult subjects, as they have a tendency to wander off or otherwise get distracted as soon as you try to photograph them. This one is quite happy to pose. I’ll post an update when the movie is released. Since we’re in the middle of the examination period, the library is very busy with students using the space in there to prepare. I think the cat is doing a sterling job as a stress release mechanism as he is very friendly and quite vocal. He likes to be stroked and petted, but isn’t keen on being picked up. In return for affection he is regularly plied with food, as this morning. 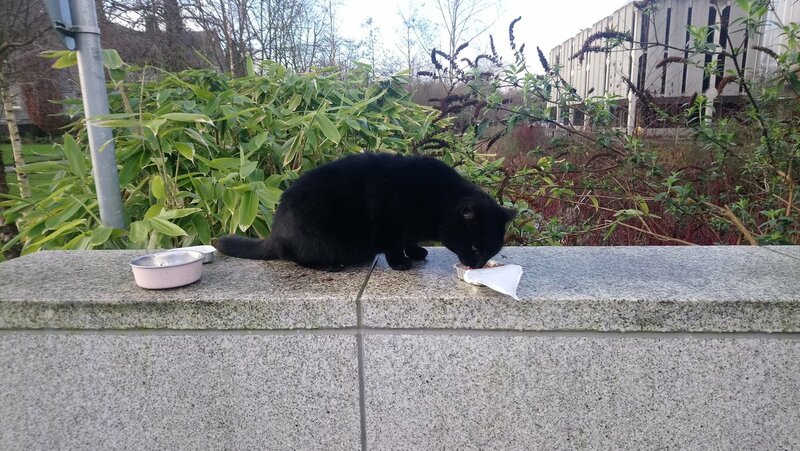 I actually carry some Dreamies in my bag in case he fancies a snack when I go past, but he was busy scoffing a whole portion of food when I took the picture above so I didn’t give him anything this morning. All in all, I think he’s got a very cushy number going. Some kind soul supplied him with a box, which is placed near his favourite lookout position. 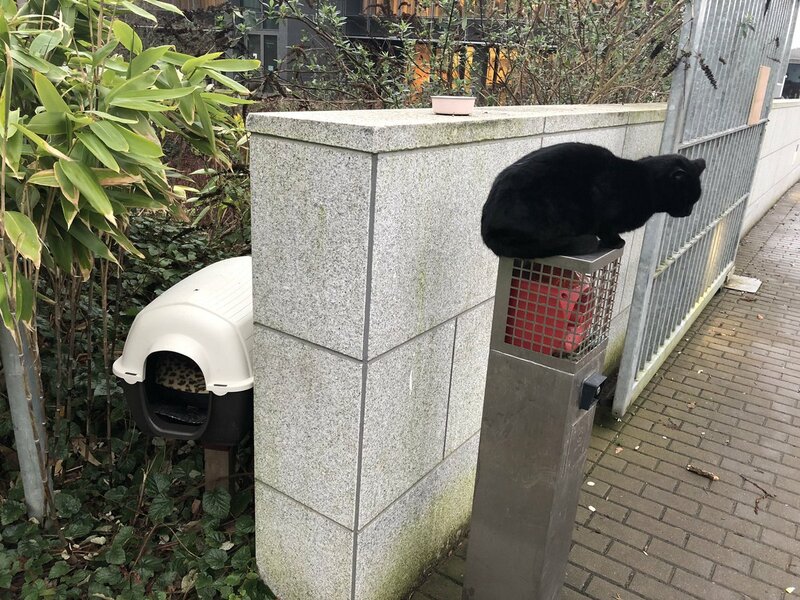 It’s pretty cold these days so I’m sure he appreciates having somewhere warm to take his naps, but he also finds other cosy places around the campus. 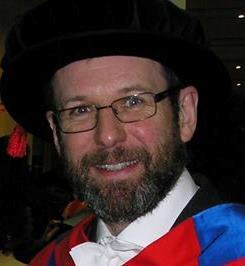 It’s been a busy day today back at work after Study Week. 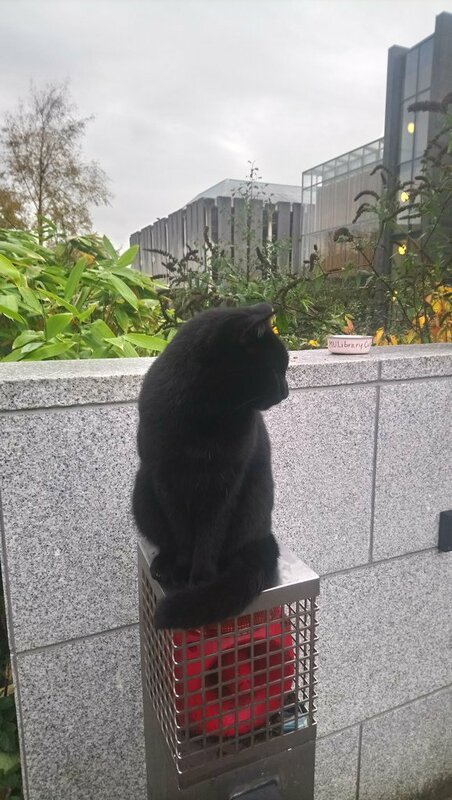 Before this week’s telecon, I thought I’d take a few minutes to share a picture of the local celebrity feline, who was on his perch this morning as I walked across campus. 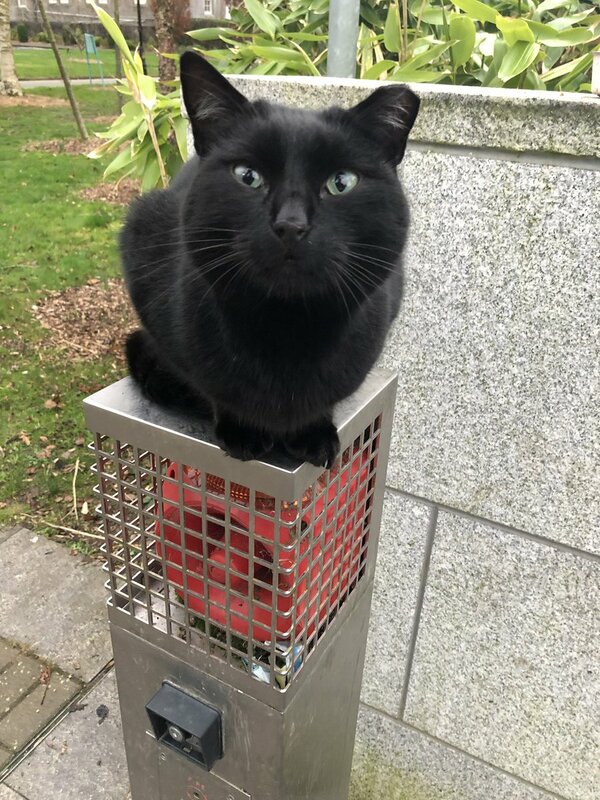 This splendid cat seems to have no name other than Maynooth Library Cat – see the dish on the wall behind – and he roams freely around Maynooth University. I don’t know where he sleeps, but he’s well nourished, in good health is a familiar sight, especially in the area in front of the library. He’s also quite friendly, and likes to be petted, although he turned his head away when I took this picture (presumably because I didn’t bring any food with me…).